The newly launched Stereax® M50 is Ilika’s thinnest, smallest and most adaptable solid state battery yet, building on proven Stereax technology and able to scale to just a few millimetres. The MedTech industry is evolving towards more pro-active patient care and the vision of the interconnected Wireless Body Area Network (WBAN) can only succeed with bio-safe power sources that are small enough to be unobtrusive, and long lasting enough to be left in place for many years. 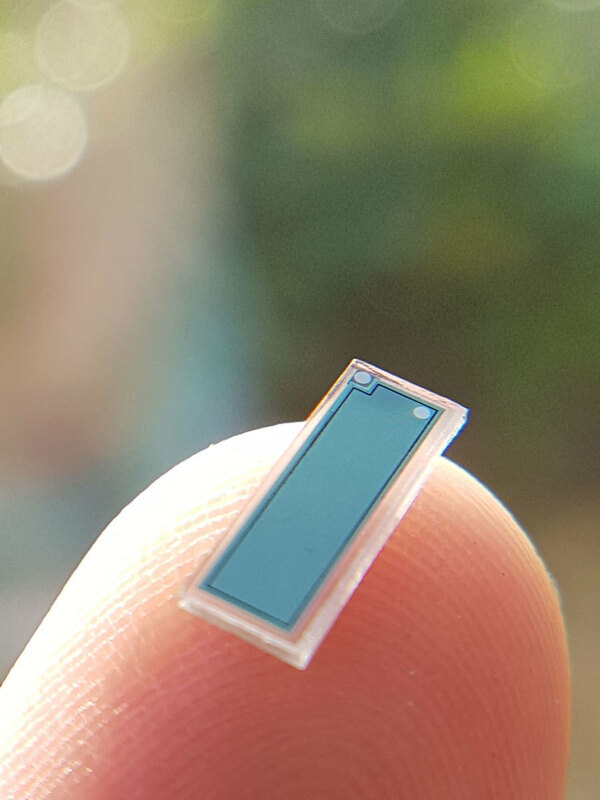 Advances can be made in a range of MedTech areas, with smaller, smarter batteries enabling new technologies and next generation developments. The Stereax M50 is a safe power solution with an ultra-long battery life, ideal for self-monitoring through blood pressure monitors, cardiac rhythm monitors and even glucose monitoring through tiny sensors embedded into contact lenses. 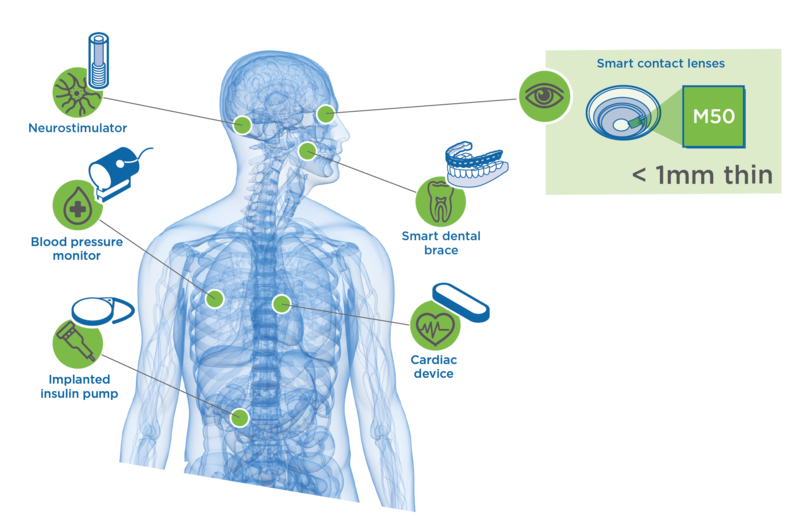 Implantables that will benefit from the small footprint and adaptability of the Stereax M50 include deep brain stimulators, cochlear implants and insulin pumps. Implantables have historically been relatively large and cumbersome, mainly due to the size of the battery powering the device, and lifespan was also nowhere near optimal. Next generation devices are made possible, helped by smaller, denser Stereax M50 batteries with an ultra-long battery life, meaning that devices can be left in place for up to 10 years without any need for intervention. These batteries can be wirelessly recharged and there is also the potential for trickle charging through energy harvesting, with power topped up by changes in body temperature or subtle movements of the heart or lungs to further lengthen the battery’s life span. Safety is a given. Stereax batteries are built on solid state technology which will not leak. Safe packaging technology, lithium-free and moisture resistant design ensure that safety is not compromised. One size or shape doesn’t need to fit all. The Stereax M50 has a footprint of 3.75 mm x 10.75 mm and other dimensions between a few mm and 10 mm can be achieved, with thickness down to 0.6 mm. The M50 can also take various square or rectangular forms. The Stereax M50 combines the latest advances in battery technology: ultra long life, biocompatible, ultra-thin and totally customizable in terms of size, dimensions and energy density, making the Stereax M50 perfectly suited to medical applications. The flexibility of its design enables the Stereax M50 to meet the exact requirements of different MedTech areas. To read more about target market applications read our market focused blog and to learn more about the Stereax M50 launch, go to our press release. Yes, I am happy for my data to be processed. Click here if you wish to stop receiving news from Ilika.